You've heard of Man vs. Wild on the Discovery Channel? I had one of those experiences today. I launched my kayak on the Humptulips River - follow the "Public Fishing" sign. I paddled down the river about a mile. Where the trees gave out I thought I had reached the bay, but I was still enclosed by banks on either side. Away from the trees, the wind picked up and I had to fight against the wind and waves. I sheltered for a while under the west bank that rose a few feet over my head. At the end of the river, I landed on a small island for a rest - a standing rest. There was nowhere to sit. At least I could rest my arms and shoulders. My next goal was to reach a rock standing out in the middle of the bay. I noticed all around me that stumps and fallen trees were stranded all around the bay. It appeared that much of the bay was quite shallow. 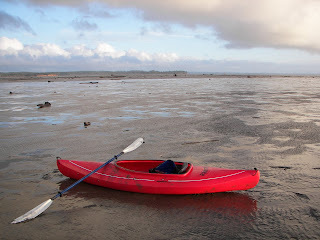 After another long stretch of paddling, I found my way blocked by a large, exposed mud flat. Seagulls wandered here and there poking at the mud. The mud flat extended as far as I could see to my right and left, so this rock was going to be unreachable. Next, I paddled in the direction of Ocean Shores, where a promising sunbreak was developing. Indeed, the sun did break out and lit up the bay nicely. The birds suddenly became more active in the sunlight, with flocks of small birds flying past at great speed just inches above the water. I paddled towards the sun and enjoyed the view as long as I dared - until I judged that I had better turn around to reach my starting point before dark. Heading back to the river, I had the wind at my back and waves pushing me along at great speed. I was making tremendous progress. Then all of a sudden, the waves disappeared and I found myself stuck on a mud flat. There was only about one inch of water beneath me - the kayak needs about three inches to float. I tried to make some forward progress by pushing my paddle against the mud, but this was extremely tiring and progress was very slow. I decided that I had better hop out of the boat and walk, towing the kayak by hand; otherwise, I would sit there on the mud flat in the dark. Walking on the mud flat was frightening at first, since I didn't know how good the footing would be or whether there might be sinkholes. A couple times I jump back into the kayak and tried pushing myself along, but that way forward was hopeless. At length, it became clear that even my one inch of water had drained away. I was high and dry. The mud was firmer now, so I trudged on, looking for my river. I had seen a historical navigation map of Grays Harbor several weeks before. The harbor is almost completely filled up with mud, except for some narrow channels where rivers or streams flush the mud out. I had to find the channel made by the Humptulips River. Fortunately, there was a white house near the water's edge standing out near the river entrance. I trudged in that direction, sticking to the higher ground. Luckily, kayaks are fairly easy to drag through mud. After a very long walk with my arms about to drop off my body, I spotted the river channel. That gave me encouragement and I finished up the mud journey, reaching the river just as the sun was setting. It felt heavenly to be on open water again. I felt like a fish who had reached his native element. I had another mile or mile and a half to paddle back to the boat ramp. The going was very slow at first, since the tide was still rushing out of the channel. But this seemed to stop and equalize and I started to make faster progress. I took a last photo, looking back towards the harbor with the first star appearing in the sky. It was very dark when I approached the boat ramp. From the sound of cars on highway 109 I knew I was close. However, I had trouble distinguishing fallen trees from the ramp. The sight of my car at the end of the journey was quite a relief. Of course, I had been imagining for the past two hours what would happen if the car had been stolen. So, the moral of the story: check the tide tables before venturing out on Grays Harbor. Time your visit with a rising tide. I am happy that this story ended well. You are an adventurer, Bob.. I hope you are having a great time out at PB, jealous--for sure!